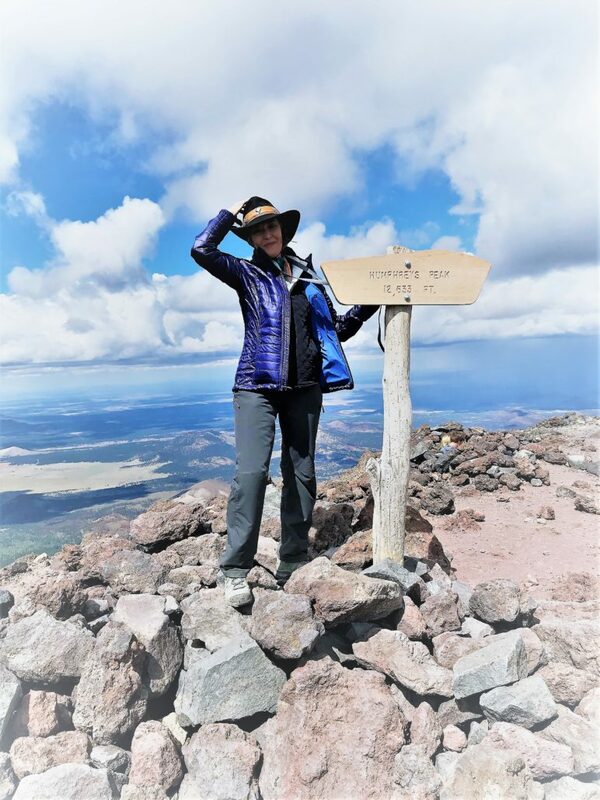 In the Summit Story, Sheryl Dawson shares her journey to climb Mt Humphreys in Flagstaff. 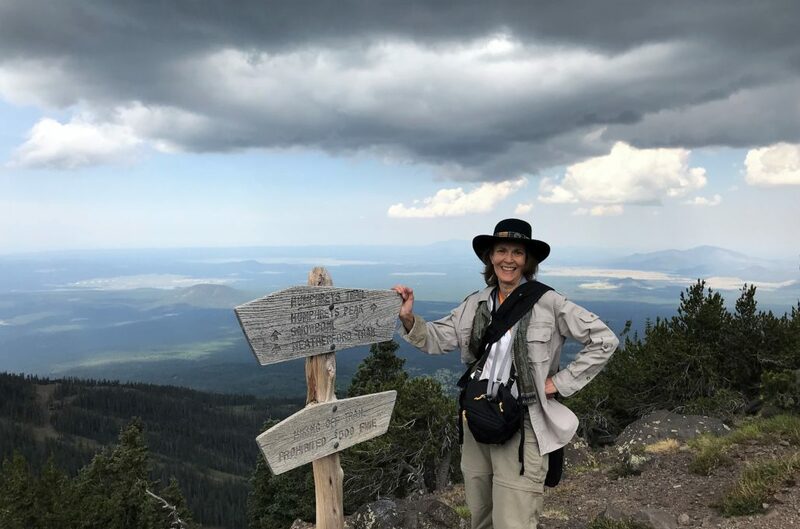 Her summit hike to 12,633’ consummated her more inclusive wellness journey that spanned several years; the Whole Life Profile significantly supported her achievement by facilitating attainment of balance in her personal and business life and relationships. While summiting Humphreys is an inspiring and visually spectacular accomplishment in itself, the universal lessons of the journey accelerated by the personal insight from the WLP may encourage you to realize life balance and achievement of your physical, career/financial, relational, psychological and spiritual goals. 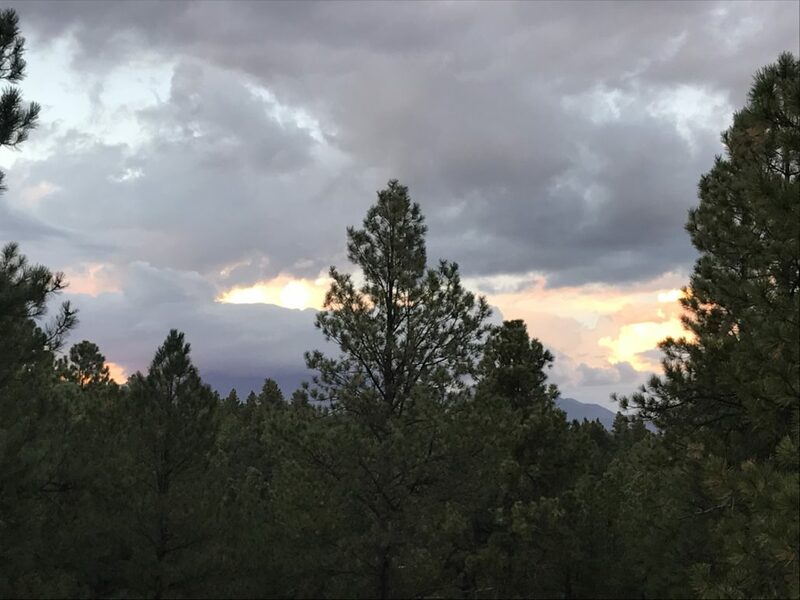 After many years in Houston, my husband Ken and I decided to relocate to Flagstaff for its destination location, four seasons and mountain living. We began the transition not really knowing how we would make it happen, renting a home in Flagstaff in January 2014 while I planned the sale of our business and Houston home. During the first 3-years, I traveled back and forth to Flagstaff three times a year to experience the winter, spring and fall seasons. Enthralled with the mountains, early on I surveyed Mt. Humphreys, the tallest peak of the San Francisco Mountains, and determined that I must climb it. My pronouncement was not made casually as I knew that it was the most challenging hike in the area and I was definitely not physically fit at the time to accomplish it. Nevertheless, I was inspired to embrace the physical challenge to parallel the seemingly mountainous financial and business challenges we faced to accomplish relocation. Since my faith was being tested, it seemed appropriate to put all life dimensions in the balance! I embarked on an enhanced fitness training program only to have it interrupted by work demands, surgery, the building of a new home and the all-consuming cross-country move. Finally settled into our new Flagstaff home by the fall of 2017, I again turned my focus to conquering the peak. I reasoned that since I was not getting any younger, time was of the essence. While hundreds hike Humphreys in the summer, for me the best time to climb is early fall; cold and snow limit access in winter and early spring, and monsoons are daily threats in the summer months. Intrepid climbers often trek the mountain at dark-thirty to summit and return before noon, but that did not seem like the best strategy for me. Knowing I had a narrow window of opportunity in early fall as the monsoons abate, I began an aggressive workout plan under a personal coach’s direction. Simultaneously, I continued my consulting practice and the process of developing connections in our new community. The summer of 2018 was intense as I balanced my personal and business goals while working out often 2 hours a day. I supplemented the coach’s recommended routine to improve overall fitness and aerobic conditioning with classes for strength, flexibility, and balance. I was trekking to the club often twice a day! In addition, on weekends I hiked 6 – 10 miles to advance my endurance and explore various trails in the Flagstaff area. My hikes were photographic excursions as well since photography is one of my passions, which I feature on my personal website, www.celebratingchrist.com. Having created a winter video series of my photography during our transition, my goal was to complete spring, summer and fall videos featuring local scenes. 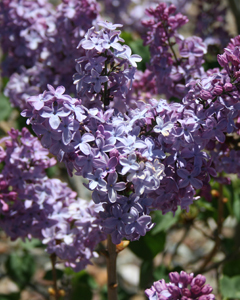 Since my very first summer in Flagstaff was during our move in 2017, I was focused particularly on capturing the flowering imagery of summer in Flag. Enthralled by the uniqueness of each trail experience, I eagerly documented my hikes. Given Humphreys’ challenging terrain, I knew it would be wise to climb with someone, even though I am usually a lone hiker. I shared my goal with just about everyone I met seeking someone to join me for the summit climb, while also exploring hiking clubs. I prayed that the Lord would send me the right hiking partner and good weather when the variable peak winds were not too extreme, a frequent complaint from hikers who had reached the summit. Climbing past the tree line, affectionately called the saddle due to its topography, traverses rugged rocks and boulders — definitely no cake walk! As summer progressed my fitness improved, so I decided to test my readiness by hiking to the saddle. I chose a weekend mid-August thinking I could beat the daily monsoon. It was a great day and within 3 ½ hours including photographic stops, I reached the saddle! There were fabulous views and lots of other hikers mingling about. But then the clouds started to rumble with thunder and toss down hail – it was time to get off the mountain as quickly as possible. The descent was challenging in the intense monsoon with constant thunder overhead and torrential rains further down the rocky path! I prayed the entire way and set the pace for several others who followed me as we hurriedly passed others along the way. An hour and a half later, without poncho or gloves, I was totally soaked and bone cold; then as we neared the trailhead large hail pelted us! I could feel the hurtling hail through my felt hat and found cover under a dense evergreen branch before it eased up sufficiently for me to hurry to my car. My hands were so numb from the cold and tightly gripping my poles to prevent a fall, that I could not access the keys in my pocket! Finally, I got into the car, turned up the heat and headed for the house. It took an hour for my hands to defrost! The good news was that I had made the saddle successfully. Even after the hurried descent, once dry and warm I felt fine with no pain. Lesson learned and undeterred, I headed to REI at my first opportunity to purchase poncho and gloves for my next attempt on the unpredictable mountain. A couple weeks later the University Hiking Club scheduled a Humphreys climb for Labor Day for which I eagerly signed up. Unfortunately, the weekend they chose was threatening rain so the climb was canceled. I did not get the word and thinking they were going to attempt at least a partial climb I showed up at the parking lot trailhead. Disappointed there was no one from the club there, I spotted a young man by himself getting ready to hike. I approached him and asked if he would mind a hiking partner. Given my age, I hastily added that I was in good shape and had recently made the climb to the saddle. It was his first time on Humphreys, so he said, “Sure”. I lent him some extra poles I had in the car and we headed up the trail. We went a bit more quickly than my first climb as I did not stop for photographic shots, however, the clouds were ominously surrounding us and by the time we reached 11,400 feet, it began to hail. I turned to my ad hoc hiking partner and asked what he thought about continuing. He was eager to go on, and since there was no thunder, I thought we would be safe and continued the climb. 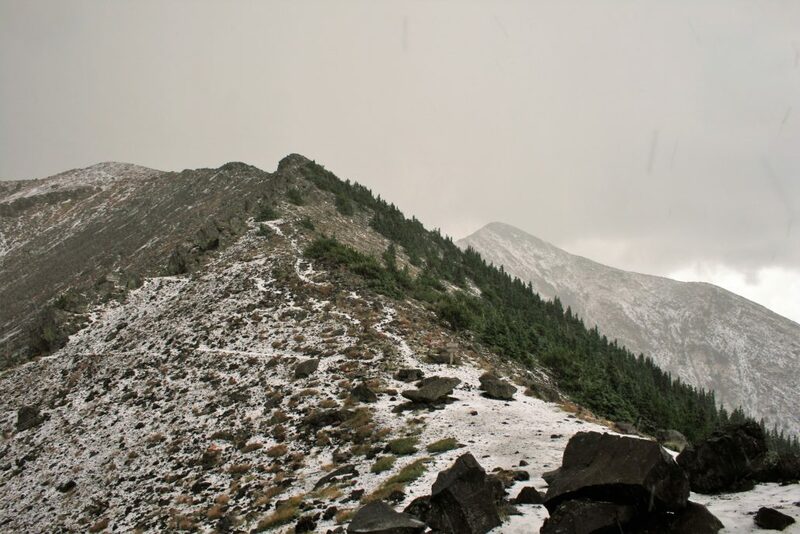 Meanwhile, the hail intensified and by the time we approached the saddle, accumulating hail obscured the rocky trail. I charged ahead, commenting that I did not recall the steep steps I was now scaling! At the saddle I donned my poncho and gloves; after a quick snack and some pictures of the view filled with threatening clouds, we hastily started the descent. My partner Nick, unfortunately, had no extra gear so he took the lead to get out of the monsoon storm! We headed down as quickly as the hail would allow, but slush made the going slick. Further down, it turned to rain and did not let up. Two monsoons and two failed attempts at the summit — with luck like that, I wondered when I would reach the peak! Nick and I were grateful for the trail companionship, however, and simply chalked it up to a learning experience. What was concerning to me is that after this climb, I experienced muscle pain. 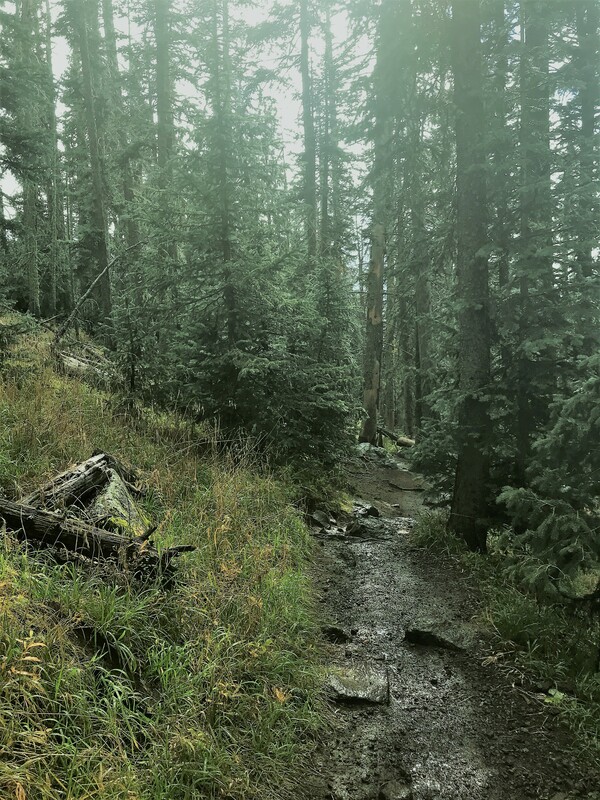 I deduced that by charging the steep hail-covered rock steps I had overextended my muscles both on the way up and down; the hail had obscured the path of least resistance that I had easily maneuvered on my first saddle attempt. Clearly, weather on Humphreys makes a big difference in hiking difficulty. That realization made me question my preparedness, but my coach assured me I was physically ready for the climb when weather permitted. An important lesson for me was to go my speed so I could climb within my physical capability. I still had to find a partner to summit; I continued to share my goal with others, very aware of the narrowing window of opportunity. At a professional meeting, I met a lady close in age who was part of the R&R Hiking Club. I followed up with Mary and just after my second attempt on Humphreys, she responded that she was interested in going. We selected a date only to have it postponed by smoke from a significant forest fire in a remote area near Sedona. Finally, we rescheduled for September 24, knowing our window of opportunity would quickly close as fall was bringing cooler temperatures and snow often comes to Humphreys in early October. As the morning sun rose September 24, an ominous cloud covered the peak and I said an earnest prayer for the clouds to lift and give us a clear day to summit. Four other women joined us for the climb and we set off with determination to summit. As we approached 11,400 feet we looked up at the big cloud shrouding the peak and declared it must leave! Soon after, it did indeed lift even though all around the surrounding areas of Flagstaff we could see gathering rain clouds. We reached the saddle, ate our snacks, and donned gloves and heavier coats to traverse the exposed one-mile rugged climb to the summit. The final leg of the hike twists and turns over rocks and boulders that obscure the summit approach. For a first-time climber, you have no idea how much further you must endure! All you know is, keep climbing upwards! Along the way are amazing views and I stopped to capture them… and my breath! At one stop, my partner Judy commented that she was going to take a peek around a large boulder to see the view from there. I followed her to confront the Inner Basin splashed with the golden aspen of Lockett Meadow – its stunning beauty literally took my breath away. I shared with her how four years ago when we first came to Flagstaff, I had climbed to the Inner Basin through Lockett Meadow. 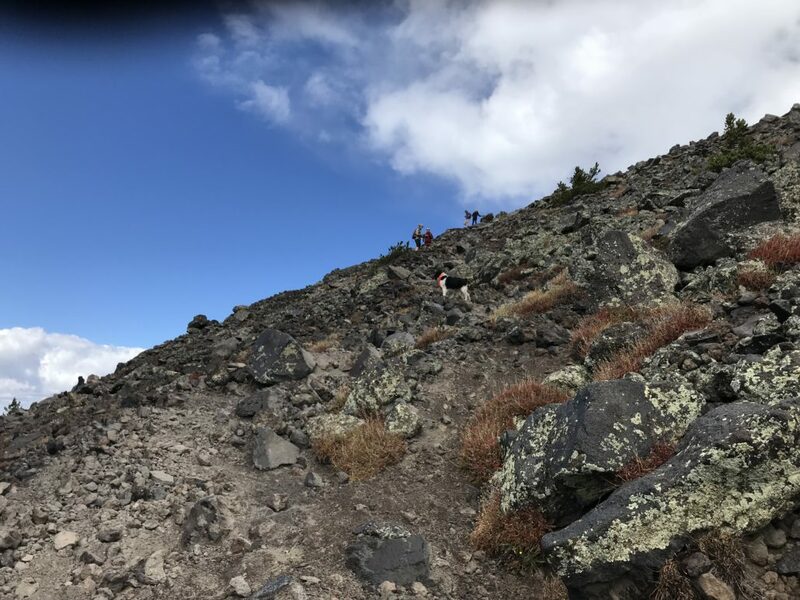 It was an inspiring hike and as I returned through the shimmering aspen interspersed with evergreens, I whispered a prayer, “Lord, make a way for us to live here, as this is where I belong.” Now, here I was climbing Mt Humphreys, beholding that amazing place of tranquility and promise. The spectacular view gave testimony that the Lord had graciously granted my heart’s desire! As we continued the trek to the top, fortunately, the wind was not too strong and I was able to climb without resistance. Having summitted Humphreys previously, Judy stayed with me and pointed out the summit as we approached it. Within a few minutes, we were at the top of Mt. Humphreys! I was breathless not from the climb, but from the awe-inspiring views of the distant Grand Canyon, painted desert and surrounding mountains. The sky was dramatically filled with monsoon clouds and visible rains accentuated by thunder and lightning. Sudden gusts reminded us that caution is the watchword on the mountain, so after a quick snack, we started down the rocky trail. We scurried to the saddle with a few hail flurries to speed us along. Back at the saddle, we shed our extra coats and gloves and having learned the lesson on my two earlier descents, I tied my poncho pack close at hand. We continued the descent and soon the clouds moved in bringing light rains. I pulled on my poncho and we hiked on without too much trouble. Finally, at the end of the trail which seemed much longer than on my prior two attempts, we wearily headed for the car. We had made it! Those last two miles were tiring, to say the least, but I felt relieved that the weather had held for our final ascent to the summit and we had experienced such dramatic views! Surely summitting Mt. 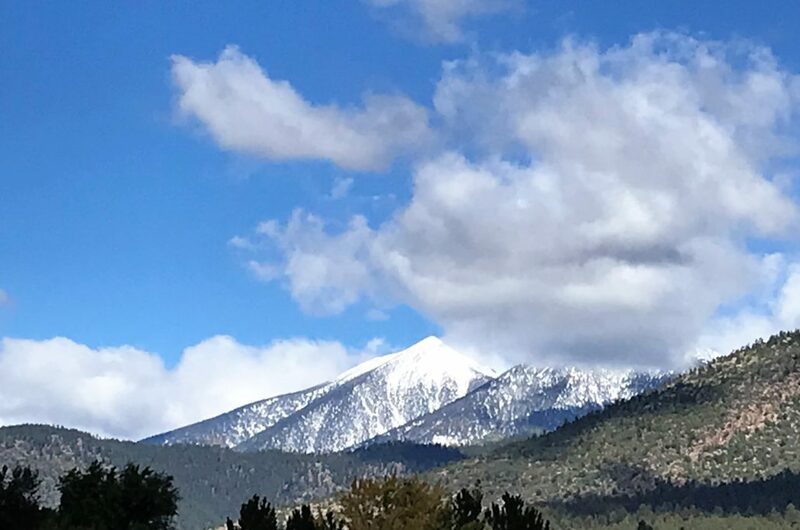 Humphreys was God’s timing as, within a week, the tropical storm Rosa from the Pacific coast brought days of rain followed by an early arrival of snow not only on the mountains but in Flagstaff proper! We had summitted Mt. Humphreys at 12,633 feet just days before our window of opportunity closed! And had we not been delayed for three weeks due to the fire and monsoons, we would not have seen the spectacular fall colors on the mountains. Add the dramatic sky to the experience and we were clearly blessed with the best of days to summit; while I had been impatient with the delays, the Lord knew just the right timing to create the most memorable hike of my life. Nearing my seventh decade of living, I have accomplished a significant physical fitness goal! Yet I was humbled by the experience, and grateful that the Lord had answered all my prayers throughout my summer training and on the day of the summit hike. The ladies with me were all seasoned hikers and in much better fitness than I. For each person, goals are unique and cannot be measured by anyone else’s goals and accomplishments. Everyone has their own set of circumstances, advantages, and challenges. The essential lesson is that fitness and wellness is an individual journey for which it is important to set goals that are right for you! Have a plan, prepare, and persevere until you achieve your goals. Having summitted Mt. Humphreys, I have set my sights on new goals, not to break any records, but to continue my wellness and fitness journey. I hope along the way to inspire others who may not think they can accomplish their goals. As I reflect on the start of my fitness journey over five years ago, I was so weak I could not even do a squat! I asked my coach at the time what the problem was and she answered, “everything!” I can chuckle about that now but at the time it was a serious shock. Squats being my immediate challenge, I kept doing them daily until I could squat correctly! Had I known then how much work I needed to be physically fit, I would have been overwhelmed. Each step I took revealed new challenges, each solution a new revelation about my body and fitness needs, and each achieved goal led to another step for ongoing progress. Praise the Lord, He has led me to the right professionals and programs to help me each step of the way. “They go from strength to strength, till each appears before God in Zion.” Psalm 84:7 Indeed, step-by-step from strength to strength, you too can achieve whatever you desire. All it takes is a plan, preparation, and perseverance… oh, and a lot of prayer! Most of us also need others to come along beside us to help plan and prepare. I mentioned my coaches and trainers who have been informative and encouraging; I also required physical therapy after surgery and discovered the value of massage therapy which I continue. My preference is to have a fitness club to access the right equipment and classes to meet my needs. Remember, your needs and support requirements are unique to you. Whatever approaches are best for you, embark today on your wellness journey. 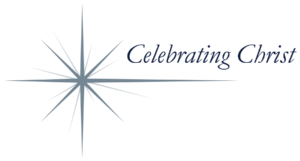 An additional resource that helped me and others whom I have supported, is the Whole Life Profile (WLP). This powerful personal assessment with optional workshop identifies one’s life imbalances and personal motivators; with this insight, you can develop an effective plan to improve your life balance and happiness. I found the WLP valuable not only for wellness programs, but also to accomplish major transitions in business, relocation, and personal challenges. If you are experiencing significant life change or career/retirement transitions, the Whole Life Profile can provide the insight you require to facilitate important decisions and manage change. Whatever mountains you face in your life, whether relational, financial, spiritual/integral, emotional/psychological, or physical health, the Whole Life Profile provides the self-perception essential to set and achieve your summit goals. In fact, it is like having a “summit” vantage point! The WLP gives insight into the big picture unique to the challenges or mountains in your life. It facilitates the long view of how your values and strengths support development in each life dimension. 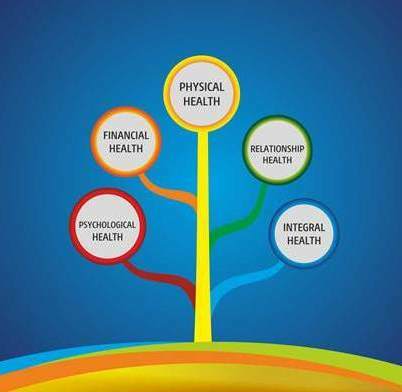 Finally, the WLP is all encompassing of the five health factors enabling you to achieve the true life-balance you desire. An investment in the WLP, is an investment in your family, friends, and colleagues, as well as your future. Become the person you envision and create the legacy for which you were born with this innovative and compelling assessment and workshop. Whether a summit experience is a physical mountain conquered or a major life challenge overcome, one cannot stay at the summit. There is always a descent or moving on process. Often, we desire to spend more time at our summit experiences to savor the elation of victory and the view. Even on the mount of transfiguration, the disciples suggested building shelters to prolong that amazing experience. But Jesus took them down the mountain and told them of future things yet to transpire. When you allow summit memories and lessons to transform your life, the experience remains part of who you are forever. 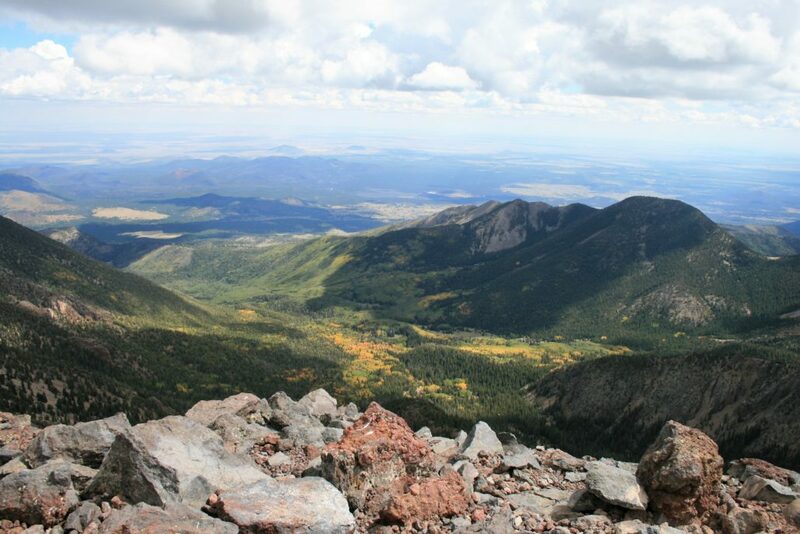 Mt Humphreys’ peak will never look quite the same to me again, as it is now a memorial of the effort expended and the amazing views I beheld from that pinnacle vantage point. Having purposefully set the Humpheys’ peak goal in the midst of significant life challenges over the last few years, my accomplishment is particularly poignant in light of His faithful guidance of my steps to overcome each one. Having descended from my mountain summits, I have new goals and summits to conquer. You too will find that descending and moving on from your summit experiences is as transforming as the ascent. Allow your summit experience to be life transforming and you too will be enriched both by the ascent, as well as the descent. I just finished reading your inspiring journey. I felt I was right with you step by step during each hike. Awesome! !